James Kamau is the chairman of the Tana Farmers Group, an organization of smallholders in central Kenya. He knows his members face a litany of challenges, common to many smallholders across East Africa. Their farms are small and yields are low, and the intermediaries who purchase their crops pay little. The farmers struggle to access the high-quality seeds and fertilizers they need to improve their productivity. And every year, they face the risk that their harvests will be decimated by drought, crop disease, or pests – a risk that is exacerbated by climate change. That’s why Kamau was so interested in the idea presented by the Kenyan agribusiness Akili Group, a firm using information and communications technology (ICT) to improve upon the traditional out-grower model. The farmers could sign contracts to supply spinach to Akili, which would offer them guaranteed prices and protect them from some of the common risks. But can the model actually deliver higher earnings for both the farmers and the business? 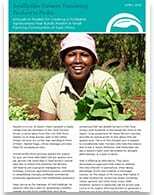 To find out, TechnoServe’s Innovation in Outcome Measurement project – a two-year program to develop and test cheaper, better, and faster ways of collecting key agricultural data – conducted a pilot study of the Akili approach to measure the model’s cost-effectiveness and examine how farmers can most benefit from the use of ICT. Under the model, farmers are grouped together and a representative is elected to serve as the point of contact with Akili. Each farmer in the group then receives high-quality spinach seedlings and an instruction guide for growing the crop. Farmers can purchase quality inputs from Akili on credit – and at a discount, due to the volume pricing that the firm can access – with the value of loans to be deducted from the earnings at harvest time. The firm also offers a low-cost insurance policy that covers any lost income from extreme weather, pests, or crop disease. Akili guarantees a year-round price for every kilogram of spinach that farmers deliver to the collection center. None of this would be possible, however, without Akili’s investments in ICT. Mobile technology allows the company to closely engage farmers in a number of ways without incurring crippling administrative costs. Akili, for example, has made most of its transactions cashless. Every farmer receives an Akili card after signing a contract with the firm, and she or he can use it, through the group leader’s smartphone, to purchase inputs. Additionally, all payments to the farmers are made electronically to bank or mobile money accounts, reducing transaction expenses at the collection centers. Akili is also able to closely track performance throughout its supply chain. The firm creates a cloud-hosted profile on each farmer, tracking the farm location, soil composition, input usage, yields, purchases, and other data. This enables Akili to target its agronomy support, which reduces the risk of poor yields and allows the company to offer more affordable crop insurance premiums to farmers. The data allows the firm to track how different interventions affect yields and earnings. Akili also uses inventory-management software to track all transactions. What is the impact of this approach? 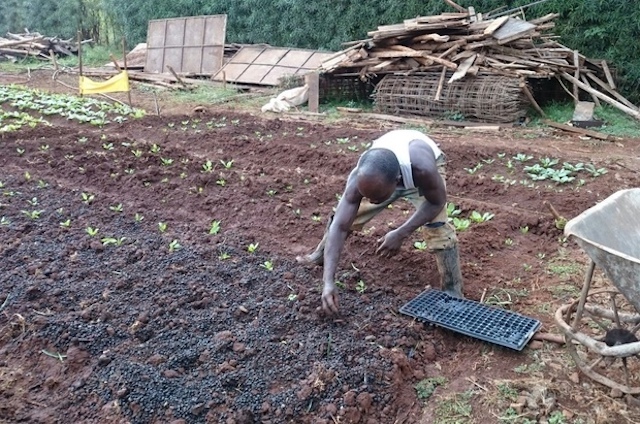 The IOM project studied data from Akili’s pilot with 400 farmers, and it found that the model had significant commercial potential for both the farmers and the business. Akili benefits from improved production of high-quality crops and reduced expenses: the IOM study found that the firm’s investments break even if it enrolls just 400 farmers to produce spinach for a year. Akili will earn an estimated $5.4 million of profit over five years by implementing this highly scalable model with 2,000 farmers. The study also found that farmers would earn at least $265 of net income per quarter-acre under the Akili model, with the potential to earn more than double that amount under ideal conditions. This represents a significant improvement in their livelihoods, as farmers who commonly grow maize in these communities earn an average of just $113 per quarter-acre. Importantly, the income from Akili is guaranteed, since crop insurance covers any lost earnings. The guaranteed market and prices and reduced risks offered by Akili convinced the members of the Tana Farmer Group to sign up with the firm. “We will switch to spinach because the exporter deals directly with us… Also, the crop is insured against natural calamities,” said Kamau, the group chairman. As the Akili pilot study found, ICT can benefit smallholders when it is used by an agribusiness to improve its efficiency and create shared value. With the development of new technological tools, it has become easier than ever to forge win-win relationships between firms and outgrowers that generate higher business earnings and improved livelihoods for smallholders. This is the second in a series of posts about new approaches piloted by the Innovation in Outcome Measurement project. A case study on the Akili model is available here. The previous post in this series addressed drone services.